Miss Elva Roberts closed her school here Friday, which was very successful. We can highly recommend her as a teacher. Source: Crittenden Press. (Marion, Ky.) 1879-1907, February 1, 1906, Image 4 - Chronicling America - The Library of Congress. 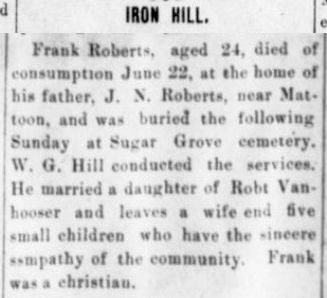 Frank Roberts, aged 24, died of consumption June 22, at the home of his father, J. N. Roberts, near Mattoon, and was buried the following Sunday at Sugar Grove cemetery. W. G. Hill conducted the services. He married a daughter of Robt. Vanhooser and leaves a wife and five small children who have the sincere sympathy of the community. Frank was a christian. Source: Crittenden Press. (Marion, Ky.) 1879-1907, June 28, 1906, Image 12 - Chronicling America - The Library of Congress. 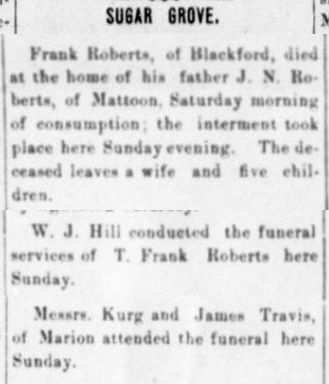 Frank Roberts, of Blackford, died at the home of his father J. N. Roberts, of Mattoon, Saturday morning of consumption; the interment took place here Sunday evening. The deceased leaves a wife and five children. W. J. Hill conducted the funeral services of T. [G.] Frank Roberts here Sunday. Messrs. Kurg and James Travis, of Marion attended the funeral here Sunday. Frank Roberts died June 23, 1906, with consumption. He was well respected and liked by all that knew him. He had not been sick but a short time. He leaves a wife and five little children to mourn his loss. Source: The Crittenden Record. (Marion, Ky.) 1904-1907, June 29, 1906, Image 8 - Chronicling America - The Library of Congress. Succumbs to Consumption After Many Months of Suffering. 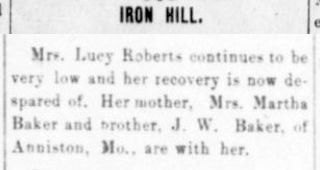 On Monday, August 27th, Mrs. Lucy J. Roberts died at her home eight miles east of Marion in the Iron Hill vicinity. She had been a sufferer from consumption of the lungs for many weary months, but had patiently borne her afflictions until death relieved her. Mrs. Roberts was Mrs. Lucy Jane Baker before her marriage to Geo. F. Roberts, which took place June 5, 1881. She professed religion in the fall of 1873, and joined the Cumberland Presbyterian church at Sugur Grove, December 7th of that year. She was 48 years, 4 months and 13 days old, having been born April 14, 1858, and died August 27, 1906. She leaves, besides her husband, two daughter, Misses Edna and Anna Roberts, two brother, Jno. Baker, of Anniston, Mo., who was with her during her last illness. Her aged mother, Mrs. Martha Ann Baker also survives her and was with her at the time of her death. The funeral took place at Sugar Grove church Tuesday afternoon at two o'clock and the interment afterwards in the cemetery at that place. Services were conducted by the pastor, Rev. W. T. Oakley. Source: Crittenden Press. (Marion, Ky.) 1879-1907, August 30, 1906, Image 5 - Chronicling America - The Library of Congress. Mrs. Lucy Roberts continues to be very low and her recovery is now despared of. 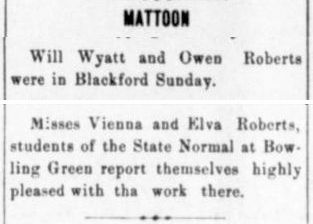 Her mother, Mrs. Martha Baker and brother, J. W. Baker, of Anniston, Mo., are with her. Source: Crittenden Press. (Marion, Ky.) 1879-1907, August 30, 1906, Image 12 - Chronicling America - The Library of Congress. Mrs. Lucy Roberts who has been quite sick, is not improving. Jno. Baker and mother, of Anniston, Mo., are here attending the bedside of their daughter and sister, Mrs. Lou Roberts. Mrs. Lou Roberts died Monday, Aug. 7, and was buried at Sugar Grove Tuesday evening. Source: The Crittenden Record. (Marion, Ky.) 1904-1907, August 31, 1906, Image 11 - Chronicling America - The Library of Congress. 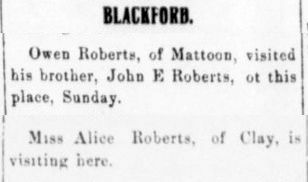 J. L. Stewart and wife and John Pickens and wife attended the funeral of Mrs. Geo. Roberts at Sugar Grove Tuesday. Source: Crittenden Press. (Marion, Ky.) 1879-1907, September 6, 1906, Image 6 - Chronicling America - The Library of Congress. 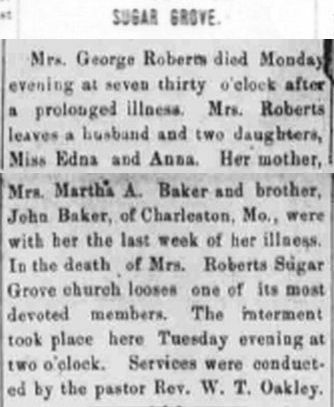 Mrs. George Roberts died Monday evening at seven thirty o'clock after a prolonged illness. Mrs Roberts leaves a husband and two daughters, Miss Edna and Anna. Her mother, Mrs. Martha A. Baker and brother, John Baker, of Charleston, Mo., were with her the last week of her illness. In the death of Mrs. Roberts Sugar Grove church looses one of its most devoted members. The interment took place here Tuesday evening at two o'clock. Services were conducted by the pastor Rev. W. T. Oakley. Source: Crittenden Press. (Marion, Ky.) 1879-1907, September 6, 1906, Image 6 - Chronicling America - The Library of Congress and Image 2 - Kentuckiana Digital Library - The Kentucky Virtual Library. "To die is gain" "This is the last and greatest contribution to mankind." Over the mouth of the grave the perfect and imperfect submit to their final separation--the dust shall return to the earth as it was; and the spirit shall return to God who gave it." But the voice of the living is: "Help Lord; for the godly man ceases; and the faithful fail from among the children of men." 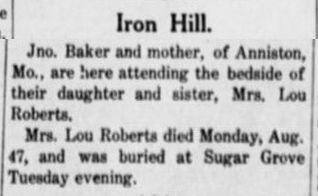 Mrs. Lou Roberts, an estimable Christian lady, of the Iron Hill neighborhood, died Aug., 27, 1906. Aged 48 years. She professed religion at Old Sugar Grove thirty-three years ago, and was received into the church at that place and was baptized by Rev. J. L. Hughey a month later--this was her christian home during her life. The Rev. W. T. Oakley, her pastor, preached funeral on the 28th to a large and sympathetic congregation, from this text: "That God may be all in all." After which her remains were laid away by tender loving hands, in the beautiful cemetery at Sugar Grove, to sleep the years away. She was the daughter of W. H. and Martha A. Baker and sister of Jno. W. Baker, of Mo. Her father died when she was a mere child. She married Geo. Roberts twenty-five years ago. She was the mother of two children, Edna and Annie. In her death the children have lost their best friend and wisest counselor and the husband the loving companion of his early manhood, and the community, church and Sunday school a noble christian character whose light will shine as the stars in the firmament forever and ever. We can not do justice to her memory or give full utterance to our emotions of sympathy so justly due to her afflicted husband and children, and the church and Sunday school which mourns on account of her absence. But we are assured that "affliction does not spring from the ground nor trouble arise by chance" and that "all things work together for the good of those who love God." The labors of this faithful servant of God, in the home, the community, the church and the Sunday school, are recorded on high. Her personal labors on earth are ended, but she being dead, her memory speaks and admonishes her survivors in the community, church and Sunday school to be also ready. Death will doubtless demand some of you this year and soon all living Sunday school workers will be numbered with the dead. A voice from heaven proclaims: "Blessed are the dead that die in the Lord, and a response seems to come back from the tomb. Whatsoever thy hand findeth to do, do it with thy might--"The night cometh in which no man can work." Where no farewell tear is shead. Keep watch 'tween me and thee. Keep watch 'tween you and me. Resolved, That we, as a community, Sunday school and church, bow submissively to the effective dispensation of God's providence and sympathize deeply with the afflicted and bereft, friends, husband and children of the deceased. God bless Aunt Marth--the mother--in her old age. We recommend earnest and importunate prayer that God will overrule this sad dispensation of his providence for his glory and the good of us all, the prosperity of the Sunday school and the salvation of many souls. T. L. WALKER, Elder and Supt. Source: Crittenden Press. (Marion, Ky.) 1879-1907, September 13, 1906, Image 6 - Chronicling America - The Library of Congress. Death is as natural as birth, and both are alike beyond the control or option of a human being who comes into the world through the portals of the one or passed out of it into the shadows of the other. Rejoicing for the one and mourning for the other, are alike natural. But between these two momentous events--the beginning and the end--there is the life, the human life, and this is largely under human control, and with this all have to do. So when the end comes, whether it be in youth or in age, in the bud, the flower, or in the fruitage of a completed existence, that death draws the veil; we begin to reflect on the events, the aims, the influence, and results of the career which, for us, has ended. As we read the pages which memory has preserved for us, and find recorded brave deeds, kind words, and loving acts, filling all the measure of existence; while we know that a gracious presence, a cheering smile, and a cordial helpfulness were the unfailing accompaniments of these acts and words, then we feel that it is fitting that we should pay our tribute of respect, affection and grateful appreciation, and that we should call the attention of those outside the circle of kindred and friends to a sweet, useful and Christian life. And such a life was that of Mrs. Louisa Jane Roberts. As wife, mother, sister and friend, she was devoted, affectionate, judicious and loyal in all these relations. For nearly half a century she had lived in the same community, interested in all that concerned the weal or woe of that community, active and efficient while strength lasted to promote the one and avert the other. While her friendships were many, and embraced those of all religious denominations, she was most loyally attached to the Cumberland Presbyterian church, of which for many years she had been a member. She passed from earth on Monday, August 27, at 7:15 p. m. Her malady being cancer. And now she's gone, gone with words of encouragement, of gratitude and love, almost the last upon her lips for those she left behind. She has gone, and a shadow has fallen in the house she has left, which would be dark indeed if the sweet memories of her life, her courage, her hope, and her faith did not inspire in them a like spirit, and bring like faith and trust. For son's of men beyond the tide of Time. Thy prayer, devoutly poured, is answered now. And faithful serve, and keep his holy law. And those who know the truth must witness bear. For justice's sake I speak the simple truth. I speak in love, nor fear dissenting voice. Such boon for her, thy constant wish and prayer. The Lord's deserving poor a friend hath lost. Concerning justice, righteousness and truth. Before the Lord and all the son's of men. And menaces with blight the common weal. Assures our hearts 'tis well with thee above. To follow thee beyond the mystic tide. Are well prepared to face the untried flood! With all the dear ones who have gone before. Within the haven of the heavenly home. While God remains a faithful God and just. It would hardly be fitting to close this friendly notice without a few words concerning her attentive and loving husband, Mr. George Roberts. One of the most beautiful redeeming traits in all his rugged and heroic nature was the unalterable love and devotion he bore for his wife, the only woman he ever loved--loved with a romantic tenderness and strength surpassing the dream of fiction. Source: The Crittenden Record. (Marion, Ky.) 1904-1907, September 28, 1906, Image 7 - Chronicling America - The Library of Congress. 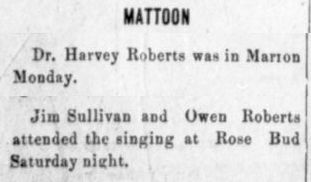 J. N. Roberts, of Mattoon, was here last week. Source: Crittenden Press. (Marion, Ky.) 1879-1907, October 4, 1906, Image 8 - Chronicling America - The Library of Congress. 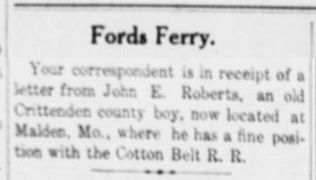 Your correspondent is in receipt of a letter from John E. Roberts, an old Crittenden county boy, now located at Malden, Mo., where he has a fine position with the Cotton Belt R. R.
Source: Crittenden Record. (Marion, Ky.) 1904-1907, February 1, 1907, Image 4 - Chronicling America - The Library of Congress. John Roberts formerly of Mattoon is at present hunting in the wilds of Arkansas. Source: Crittenden Record-Press. (Marion, Ky.) 1907-1909, February 21, 1907, Image 3 - Chronicling America - The Library of Congress. Misses Tida [Vienna?] and Eva [Elva?] Roberts and Bro. Owen, are visiting relatives in Blackford this week. Source: Crittenden Record-Press. (Marion, Ky.) 1907-1909, February 28, 1907, Image 8 - Chronicling America - The Library of Congress. E. A. Summerville and husband to Ida M. Roberts 3 acres near Mattoon $200. Source: Crittenden Record-Press. (Marion, Ky.) 1907-1909, March 7, 1907, Image 1 - Chronicling America - The Library of Congress. J. N. Roberts and wife, of Mattoon vicinity, were here last Wednesday doing some shopping. While here they were the guests of Mrs. E. H. Porter. Misses Vienna and Elva Roberts, of Mattoon, two of the county's best teachers, left Friday night for Bowling Green, where they will enter the Business University of Cherry Bros. Miss Elva closed her school at Applegate and Miss Vienna closed her school at Weston in January. Miss Vienna Roberts and sister Elva have gone to Bowling Green to attend the Bowling Green Normal institute. Source: Crittenden Record-Press. (Marion, Ky.) 1907-1909, March 7, 1907, Image 5 - Chronicling America - The Library of Congress. J. N. Roberts, visited relatives at Piney Tuesday. 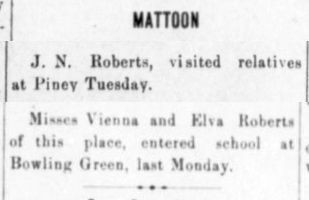 Misses Vienna and Elva Roberts of this place, entered school at Bowling Green, last Monday. Source: Crittenden Record-Press. (Marion, Ky.) 1907-1909, March 7, 1907, Image 8 - Chronicling America - The Library of Congress. Dr. Harvey Roberts was in Marion Monday. Jim Sullivan and Owen Roberts attended the singing at Rose Bud Saturday night. Source: Crittenden Record-Press. (Marion, Ky.) 1907-1909, March 21, 1907, Image 9 - Chronicling America - The Library of Congress. Mrs. Ida Roberts was the guest of Mrs. Belle Summerville Wednesday. Source: Crittenden Record-Press. (Marion, Ky.) 1907-1909, March 28, 1907, Image 8 - Chronicling America - The Library of Congress. 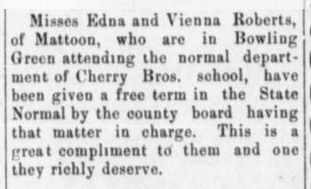 Misses Edna [Elva] and Vienna Roberts, of Mattoon, who are in Bowling Green attending the normal department of Cherry Bros. school, have been given a free term in the State Normal by the county board having that matter in charge. This is a great compliment to them and one they richly deserve. Source: Crittenden Record-Press. (Marion, Ky.) 1907-1909, April 11, 1907, Image 5 - Chronicling America - The Library of Congress. Will Wyatt and Owen Roberts were in Blackford Sunday. 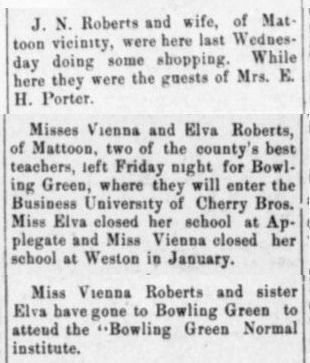 Misses Vienna and Elva Roberts, students of the State Normal at Bowling Green report themselves highly pleased with tha [the] work there. Source: Crittenden Record-Press. (Marion, Ky.) 1907-1909, April 11, 1907, Image 8 - Chronicling America - The Library of Congress. 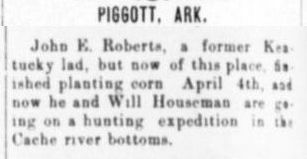 John E. Roberts, a former Kentucky lad, but now of this place, finished planting corn April 4th, and now he and Will Houseman are going on a hunting expedition in the Cache river bottoms. Ninnia Belle and Lula Lee Berry, of Sturgis, visited Elizabeth [Elva] and Vianna [Vienna] Roberts, last week. Source: Crittenden Record-Press. (Marion, Ky.) 1907-1909, April 18, 1907, Image 5 - Chronicling America - The Library of Congress. 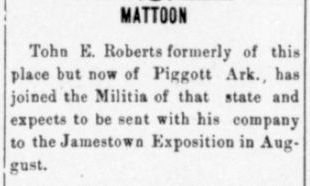 Tohn [John] E. Roberts formerly of this place but now of Piggott Ark., has joined the Militia of that state and expects to be sent with his company to the Jamestown Exposition on in August. Source: Crittenden Record-Press. (Marion, Ky.) 1907-1909, May 2, 1907, Image 8 - Chronicling America - The Library of Congress. Miss Elva Roberts, of this placo [place], left Monday to begin school at Applegate. Source: Crittenden Record-Press. (Marion, Ky.) 1907-1909, July 11, 1907, Image 8 - Chronicling America - The Library of Congress. 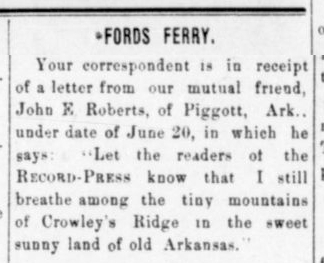 Your correspondent is in receipt of a letter from our mutual friend, John E. Roberts, of Piggott, Ark., under date of June 20, in which he says: "Let the readers of the RECORD-PRESS know that I still breathe among the tiny mountains of Crowley's Ridge in the sweet sunny land of old Arkansas. Source: Crittenden Record-Press. (Marion, Ky.) 1907-1909, July 18, 1907, Image 7 - Chronicling America - The Library of Congress. Dr. Harvey Roberts and family have gone to Mt. Carlow, Webster county, to make it their home for a short time. Jno. E. Roberts and wife arrived here last week after spending several months in Arkansas, Texas and Indian Territory. 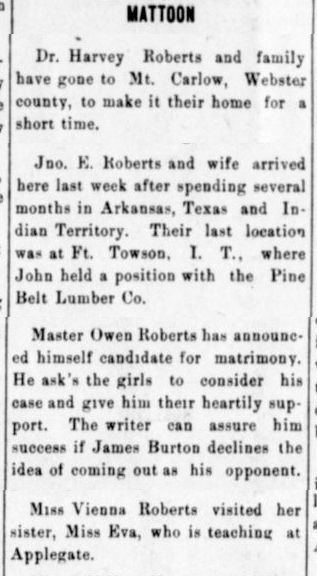 Their last location was at Ft. Towson, I. T., where John held a position with the Pine Belt Lumber Co.
Master Owen Roberts has announced himself a candidate for matrimony. He ask's the girls to consider his case and give him their heartily support. The writer can assure him success if James Burton declines the idea of coming out as his opponent. Miss Vienna Roberts visited her sister, Miss Elva, who is teaching at Applegate. Source: Crittenden Record-Press. (Marion, Ky.) 1907-1909, August 1, 1907, Image 9 - Chronicling America - The Library of Congress. Mrs. Ida M. Roberts and little son, Mattoon [Lewin? ], visited in this vicinity. Source: Crittenden Record-Press. (Marion, Ky.) 1907-1909, August 15, 1907, Image 3 - Chronicling America - The Library of Congress. Misses Vienna and Elva Roberts spent Saturday and Sunday at home. 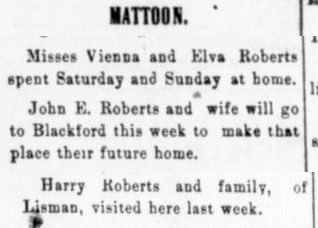 John E. Roberts and wife will go to Blackford this week to make that place their future home. Harry [Harvey] Roberts and family, of Lisman, visited here last week. Source: Crittenden Record-Press. (Marion, Ky.) 1907-1909, September 12, 1907, Image 8 - Chronicling America - The Library of Congress. 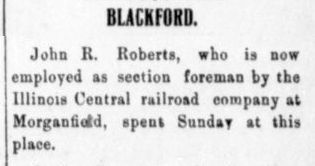 John R. [E.] Roberts, who is now employed as section foreman by the Illinois Central railroad company at Morganfield, spent Sunday at this place. 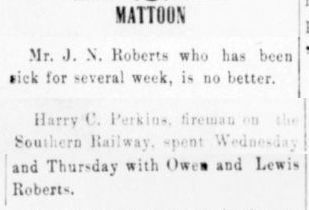 J. E. Roberts spent Sunday at Mattoon with his father, J. N. Roberts, who has been in very delicate health for several weeks. Source: Crittenden Record-Press. (Marion, Ky.) 1907-1909, October 3, 1907, Image 9 - Chronicling America - The Library of Congress. Owen Roberts, of Mattoon, visited his brother, John E. Roberts, of this place, Sunday. Miss Alice Roberts, of Clay, is visiting here. Source: Crittenden Record-Press. (Marion, Ky.) 1907-1909, October 10, 1907, Image 8 - Chronicling America - The Library of Congress. Master Owen Roberts and sister, Elva, were in Marion Saturday. 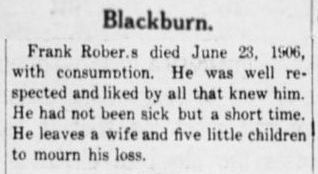 J. N. Roberts, who has been quite sick for several weeks, is convalescent. Source: Crittenden Record-Press. (Marion, Ky.) 1907-1909, October 17, 1907, Image 8 - Chronicling America - The Library of Congress. 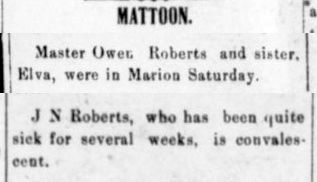 Owen Roberts, of Mattoon, spent Sunday here with his brother, J. E. Roberts. Source: Crittenden Record-Press. (Marion, Ky.) 1907-1909, October 31, 1907, Image 8 - Chronicling America - The Library of Congress. Mr. J. N. Roberts who has been sick for several weeks, is no better. Harry C. Perkins, fireman on the Southern Railway, spent Wednesday and Thursday with Owen and Lewis [Lewin] Roberts. Source: Crittenden Record-Press. (Marion, Ky.) 1907-1909, November 7, 1907, Image 9 - Chronicling America - The Library of Congress. John E. Roberts, of Blackford, was here Thursday. Source: Crittenden Record-Press. (Marion, Ky.) 1907-1909, November 21, 1907, Image 3 - Chronicling America - The Library of Congress. Owen Roberts, of Mattoon, visited here Saturday. Source: Crittenden Record-Press. (Marion, Ky.) 1907-1909, November 28, 1907, Image 9 - Chronicling America - The Library of Congress. Uncle Jim Morgan and J. E. Roberts called of W. J. Farley Sunday. Source: Crittenden Record-Press. (Marion, Ky.) 1907-1909, December 5, 1907, Image 8 - Chronicling America - The Library of Congress. Miss Elva Roberts who is teaching at Applegate, Crittenden county, spent last Thursday in our town. Source: Crittenden Record-Press. (Marion, Ky.) 1907-1909, December 12, 1907, Image 8 - Chronicling America - The Library of Congress.